The women’s soccer team, now ranked 10th nationally, beat Nazareth College 2–0 on Tuesday afternoon. Their record is now 8–1–1 for the season, and Tuesday’s game was the fifth win in a row for the Tartans. It was a physical game, and the Tartans relied on their speed and skill to defeat the Golden Flyers. Nazareth dominated possession for the first few minutes of play, but the Tartans pushed back hard. Eight minutes into the first half, sophomore forward Ryan Casey scored her first goal as a Tartan off an impressive solo effort. Casey took the ball from the right side of the field and dribbled through the defense before giving the Tartans the 1–0 lead. Nazareth continued their offensive momentum, but stellar defense by the Tartans held them to just one shot on goal. As the first half continued, play began to get rougher, with a total of eight fouls called in the first half alone. Pressure continued on both ends throughout the half to no avail, although in the 36th minute, a corner taken by senior midfielder Tori Iatarola appeared to cross the goal line. However, the ruling on the field was no goal, and the half ended with the Tartans up 1–0. In the second half, the Tartans dominated initial play, with multiple shots and corners in the first few minutes. In the 58th minute, on the third corner in a row, junior midfielder Tessa Allen headed the kick in from the far back post past the goalie, scoring her first goal of the season and the second goal of the day for the Tartans. Carnegie Mellon continued this level of play, and although they dominated Nazareth in the second half of the game, they were unable to score another goal. The total foul count for the game was 18 fouls overall, and in the 77th minute, Nazareth was given a yellow card. Although nothing came of these penalties, despite the Tartans being given a kick only a few yards from outside the box, this physical style of play dominated the game and made for an aggressive showing. First-year goalkeeper Carolyn Botz secured her sixth shutout of the season, making strong plays out of the back end despite only needing to make one save. The Tartans finished the game with 14 shots, 8 on goal, while the Golden Flyers had only 5 shots with 1 on goal. The Tartans also had 8 corner kicks in the game and used them to set up many of their offensive plays. On Saturday, Oct. 7, the Tartans took on Brandeis University and tied 1–1. The Tartans are now 8–1–2 for the season and 1–0–1 in University Athletic Association (UAA) play. The two scores came at the last minute of each half. The Judges scored first after converting a corner kick with 47 seconds left in the first half. 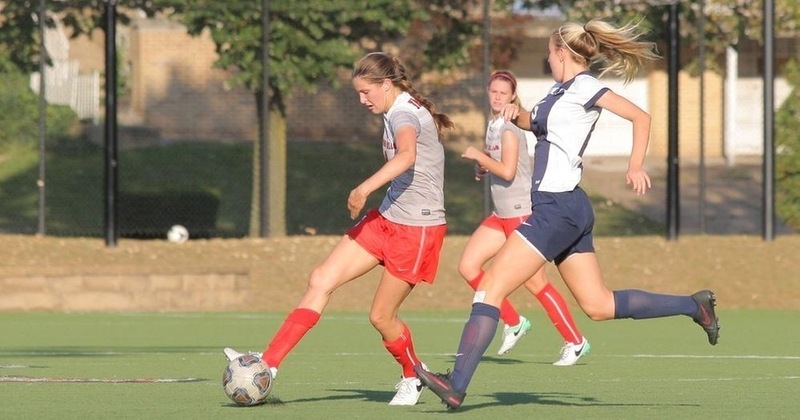 Junior midfielder Tessa Adams, assisted by senior defender Katie Strycharz, scored the lone goal for the Tartans with 55 seconds left in the second half to tie the game 1–1. The Tartans will next face the top ranked University of Chicago in Chicago, IL on Friday, Oct. 13.